Each team starts the class with 6 cups stacked as shown below. Each cup represents a point for that team. At the end of class, the team with the most cups is the winner. Ball: Each student gets a chance to throw a ball at the opposite teams tower of cups. Any cups that fall down, that team loses those cups. 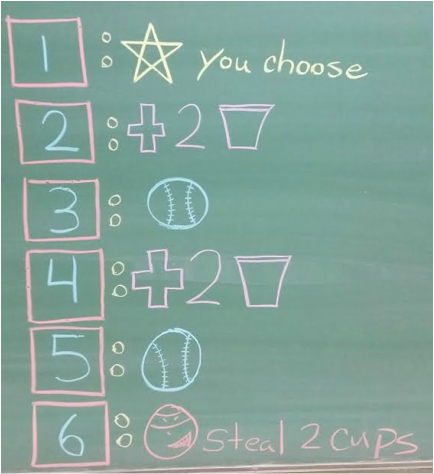 Starting the class with 6 cups allows the teacher to instantly have the power to take away cup points for misbehavior. Throughout class the teacher should be rewarding outstanding students with cups, and also taking away cups from students that are misbehaving. 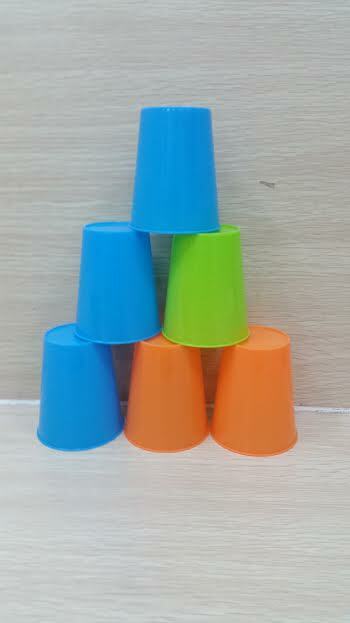 Cups can be stacked on chairs on the side of the classroom OR under the front board on the floor. This point system is great visually for students to see how they are doing compared to the opposite team. It also allows to play simple games within the board game and other drills being played.